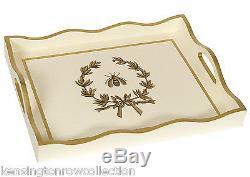 "NAPOLEONIC BEE" HAND PAINTED WOODEN SERVING TRAY Entertain your guests in style with our elegant handled serving tray. Showcasing a decorative scallop edge border, this tray is masterfully hand painted with a classical Napoleonic bee surrounded by a decorative garland set against an ivory background. Measures approximately: 13"W x 16"L x 2.5D. The item "SERVING TRAYS NAPOLEONIC BEE WOODEN SERVING TRAY IVORY HAND PAINTED TRAY" is in sale since Saturday, April 23, 2016.